The UK Independence Party is clearly being sold to ordinary voters as a movement to liberate us all. And sadly many workers will back it. Yet as the article ‘People Not Profits’ mentions, UKIP is no alternative at all (Editorial, May Socialist Standard). UKIP sells a kind of bargain-basement nationalism that seeks to blame workers outside the UK for our problems. It wants to close the borders, and substitute ‘patriotism’ for compassion. And its policies are designed to transfer even more wealth and income into the pockets of the rich. It’s the economic system that oppresses people, not those who move to the U.K. We need to reject the false ideology of nationalism UKIP promotes, as well as its economic ideas. Regarding the article on 15 Central Park West (‘Voice from the Back’, April Socialist Standard), some years ago I took a stroll of some of the streets where the buildings look out on to Central Park. The buildings, a mixture of mansions, hotels and apartment blocks, were beautiful and were obviously occupied by the wealthy. The streets which intersected with the prosperous-looking avenue contained some atrocious slums, many of which were right next to the above buildings. Here one saw a blatant and obvious contrast between wealth and poverty. It should have been enough to have the least perceptive onlooker wonder if perhaps there wasn’t something wrong in a society that could create such extremes. 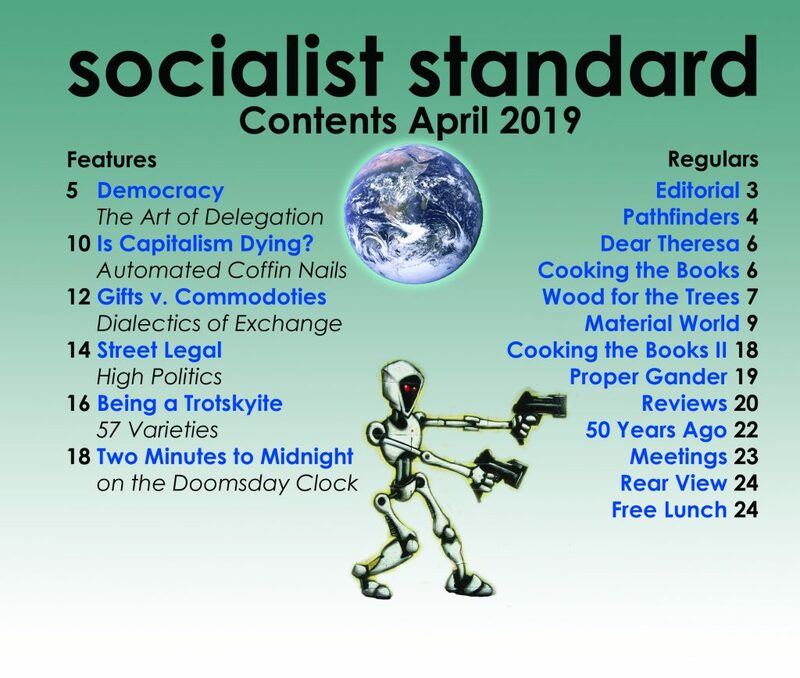 I just wanted to write and say I really enjoyed reading the three election manifestos and supporting article carried on pages 10 to 12 of the May Socialist Standard. 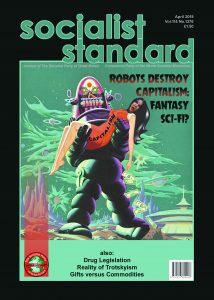 In clear, modern and accessible language, they all set out a powerful and compelling case for a world socialist society, and certainly inspired me to do something positive to bring this about! Perhaps the most striking part of the International Workers’ Day demonstration on May Day 2014 was the large contingents of Turkish and Iranian ‘communists’ in London. Tens of attendees turned up parading plain red flags in co-ordinated outfits from organisations such as Alevi Federation, Day-Mer (ostensibly, the Turkish community centre in North London) , RedHack, Worker Communist Parties of Iraq and Iran. Perhaps the most prominent figure inspiring some of these groups is the late Mansoor Hekmat (who died in 2002), who rejected both ‘Stalinism’ and Islamism and urged communists to ‘go back to Marx’. Not in itself sufficient for a socialist, but if ‘Marxist-Hekmatism’ is popular enough for a ‘Marx-Hekmat’ society in London or in the large populations of Turkey or Iran, then perhaps it is worthy of further critique by the true socialists in London.